For a quarter century in the House, colleagues knew Mary T. Norton as “Battling Mary,” a reformer who fought for the labor and the working–class interests of her urban New Jersey district. An apprentice with one of the most notorious Democratic political machines in America, Norton emerged from Jersey City as the first woman to represent an eastern state and eventually chaired four House committees. Norton’s career was defined by her devotion to blue–collar concerns. Mary Teresa Hopkins was born on March 7, 1875, in Jersey City, New Jersey. She was the second surviving child of Thomas Hopkins, a road construction contractor, and Maria Shea, a governess.1 Mary kept house after her mother died and graduated from Jersey City High School. She moved to New York City in 1896 and attended Packard Business College. She later worked as a secretary and stenographer until she married Robert Francis Norton in April 1909. To cope with the death of her one–week–old son, Robert, Jr., in 1910, she began working at the Queen’s Daughters Day Nursery and, within three years, became its secretary. By 1916, she was elected nursery president. It was in her capacity as a fundraiser for the nursery that she made a large number of political contacts. Robert Norton, who died in 1934, supported her career to the end. After World War I, in search of municipal support for the nursery, she met Jersey City’s mayor and powerful political boss, Frank “I Am the Law” Hague. Mayor Hague took office in 1917 and controlled Hudson County politics for three decades with a mixture of patronage, programs for his labor constituency, and, at times, direct intimidation of his opponents. Eager to bring newly enfranchised women into the Democratic Party (and under his political machine), the mayor pressed Norton to enter politics as his protégé. “It’s your duty to organize the women of Jersey City,” Hague commanded.2 When Norton, who had not been involved in the suffrage movement, protested that she didn’t know politics, Hague snapped back, “Neither does any suffragist.”3 In 1920, with Hague’s backing, Norton was the first woman named to the New Jersey Democratic Committee and, in 1921, was elected its vice chairman, serving in that capacity until 1931. She became the first woman to head any state party when she was elevated to chairman in 1932 (she served until 1935 and was again named chairman from 1940 to 1944). In 1937, when Labor Committee Chairman William P. Connery, Jr., died, Norton resigned her chairmanship of the District Committee to succeed him as head of the powerful Labor Committee. She had been the second–ranking Democrat on the panel since 1929. When the Democrats gained the majority in 1931, Norton exercised increased influence over the evolution and passage of major legislation. By the time she became chair in June 1937, the so–called Second New Deal was in full swing. While much of the legislation passed during the first phase of the New Deal (1933–1935) focused on economic recovery, the second wave of programs sought to alleviate poverty and provide a social safety net that included Social Security benefits and unemployment insurance. In 1947, when Republicans regained control of the House and Norton lost her chairmanship to New Jersey’s Fred H. Hartley, she resigned her Labor Committee seat in protest. “He has attended only 10 meetings of this committee in 10 years,” Norton declared. “I refuse to serve under him.” During her final term in Congress, when the Democrats wrested back majority control, she chaired the House Administration Committee. At age 75, after serving 12 terms, Norton declined to run for re–election in 1950. She served briefly as a consultant to the Women’s Advisory Committee on Defense Manpower at the Department of Labor in 1951 and 1952. She left Washington to settle in Greenwich, Connecticut, to live near one of her sisters. Norton died there on August 2, 1959. 1It is unclear how many siblings were in the Hopkins family. There were as many as seven, though at least three died in infancy. See, Hope Chamberlin, A Minority of Members: Women in the U.S. Congress (New York: Praeger, 1973): 55; “Mary Norton,” Marcy Kaptur, Women of Congress: A Twentieth–Century Odyssey (Washington, D.C.: Congressional Quarterly Press, 1996): 34. Carmela A. Karnoutsos, “Mary Teresa Norton,” in “Jersey City Past and Present,” published online at http://www.njcu.edu/programs/jchistory (accessed 13 November 2003). 2“Mary T. Norton,” Current Biography, 1944 (New York: H.W. Wilson Co., 1944): 500–503. 3Helen C. Camp, “Norton, Mary Teresa Hopkins,” American National Biography (ANB) 16 (New York: Oxford University Press, 1999): 529–530. 5“Mary T. Norton,” Current Biography, 1944: 500. 6Chamberlin, A Minority of Members: 54. 8“Mary T. Norton,” Current Biography, 1944: 501; Camp, “Mary Teresa Hopkins Norton,” ANB. 9For further reading on the Fair Labor Standards Act as part of the New Deal, see Michael E. Parrish, Anxious Decades (New York: Norton, 1992): 382–383. 10Kaptur, Women of Congress: 46. 11“Mary T. Norton,” Current Biography, 1944: 501. 12Amy Porter, Collier’s, August 1943, Vol. 112: 22. 13“Mary T. Norton,” Current Biography, 1944: 502. See also, John Whiteclay Chambers II, “Norton, Mary Teresa Hopkins,” Dictionary of American Biography, Supplement 6 (New York: Scribners, 1981): 480. 14“Mary T. Norton,” Current Biography, 1944: 502. Papers: 1920-1960, 10 volumes and 10 boxes.. Correspondence, including letters from Franklin D. Roosevelt, Eleanor Roosevelt, and Harry S. Truman. Also includes congressional political subjects file, speeches and writings, biographical data, photographs, and scrapbooks. The unpublished memoirs of Mary T. Norton and correspondence concerning possible publication are included. A finding aid is available in the repository. Papers: In the Thelma Parkinson Sharp Papers, 1874-1976, approximately 0.8 cubic foot. Subjects covered include Mary Teresa Norton. A finding aid is available in the repository. Papers: In the Women's Project of New Jersey Records, 1984-1990, approximately 11 cubic feet. Subjects covered include Mary Teresa Norton. Papers: In the Ludwell Denny Papers, 1917-1969, 3.2 cubic feet and 2 reels of microfilm. Subjects covered include Mary Teresa Norton. An inventory is available in the repository. Papers: In the Molly Dewson Papers, 1861-1962, 1.25 linear feet. Subjects covered include Mary Teresa Norton. The papers are also available on microfilm. A finding aid is available in the repository and on microfilm. Papers: In the Emma Guffey Miller Papers, 1900-1972, 1 linear foot. Subjects covered include Mary Teresa Norton. The papers are also available on microfilm. A finding aid is available in the repository and on microfilm. Papers: In the Lorena Hickok Papers, 1913-1962, 8 linear feet. Subjects covered include Mary Teresa Norton. A folder list is available in the repository. Kaptur, Marcy. Women of Congress: A Twentieth-Century Odyssey. Washington: Congressional Quarterly, 1996. 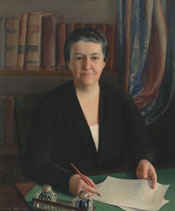 "Mary Teresa Norton" in Women in Congress, 1917-2006. Prepared under the direction of the Committee on House Administration by the Office of History & Preservation, U.S. House of Representatives. Washington: Government Printing Office, 2006. Mitchell, Gary. "Women Standing for Women: The Early Political Career of Mary T. Norton." New Jersey History 96 (Spring-Summer 1978): 27-42. Rees, Maureen. "Mary Norton: A Grand Girl." Journal of the Rutgers University Libraries 47 (December 1985): 59-75.